After a quick lunch and stroll at 5th arrondissement (Latin Quarter), our next destination was Trocadéro. Even when we’ve been here the day before, my husband and I ventured to this place once again, for the time we had yesterday was too short. The views would also be different this time, as we went out during the day towards Tour Eiffel. We hopped on the Big Bus Paris’ tour bus going to 8th and 16th arrondissement in Paris before hopping off at Trocadéro. There were many people enjoying the view of the Eiffel Tower at this time of day, grabbing the opportunity to take fantastic photos while the sun’s still up. 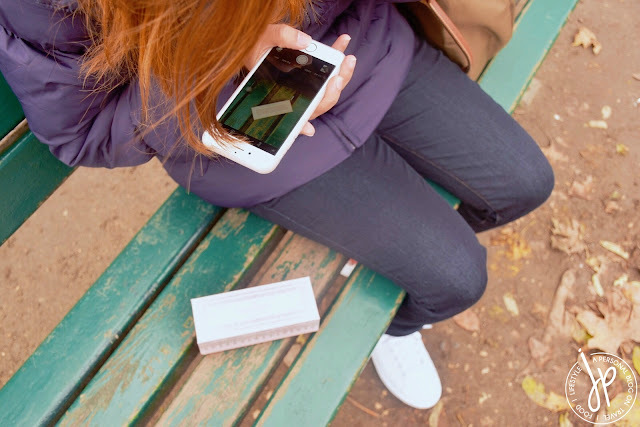 It’s only apt that we do the same too, so we set-up our very useful tripod for our couple shots around Paris. 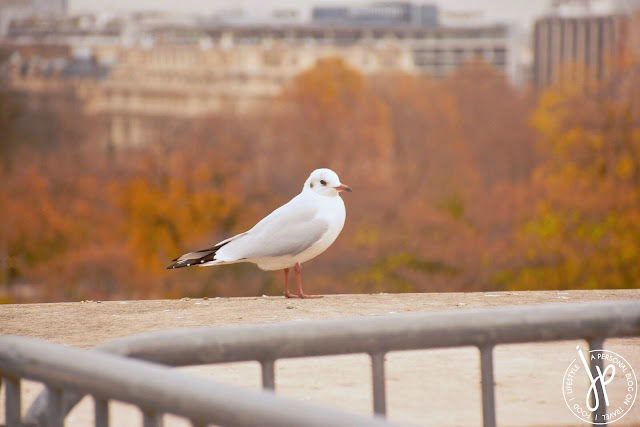 From the famous viewing area, we took the stairs going to Jardins du Trocadéro. If you happen to see a lot of tourist photos with the background of the Eiffel Tower and a staircase, that area is at this place. The garden wasn’t as big as I imagined, but it’s definitely a good location to take multiple shots of the tower from afar. 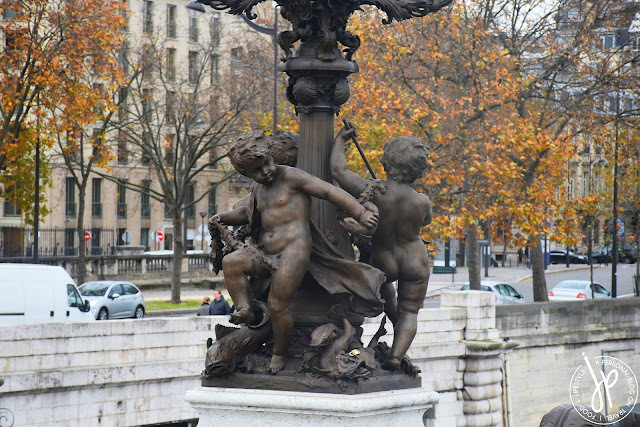 We crossed Pont d’Iéna on foot (“Jena Bridge” in English!) 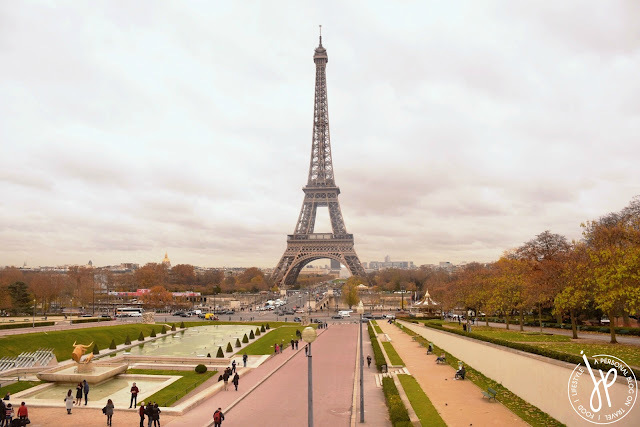 going to Tour Eiffel, which traverses over the Seine. 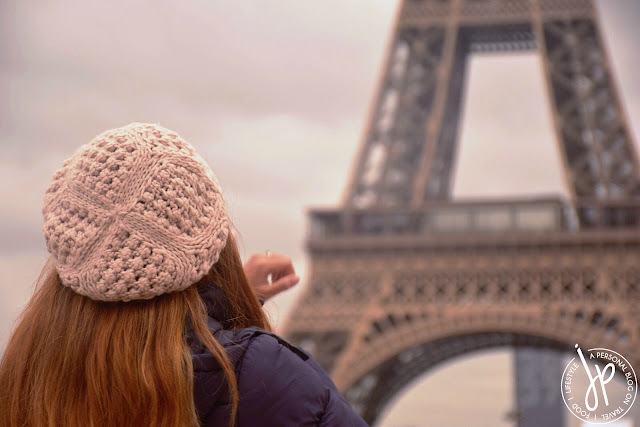 We only walked at the sidewalks, though I saw a number of tourists who were brave enough to stand in the middle of the road (while vehicles passed by in opposite directions) to get a better view (and photos) of the Eiffel Tower. I was thinking of going up the tower, but ended up saving money instead. The entire afternoon was very laidback. We went to the park and just sat on one of the benches facing the tower. 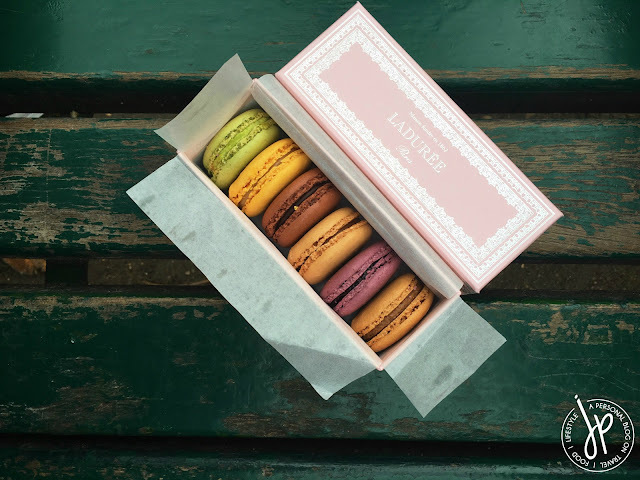 My husband and I watched people pass by and ate a couple of macarons from Ladurée which we bought the day before. Of course, we took advantage taking snaps of us while we’re in the City of Light! 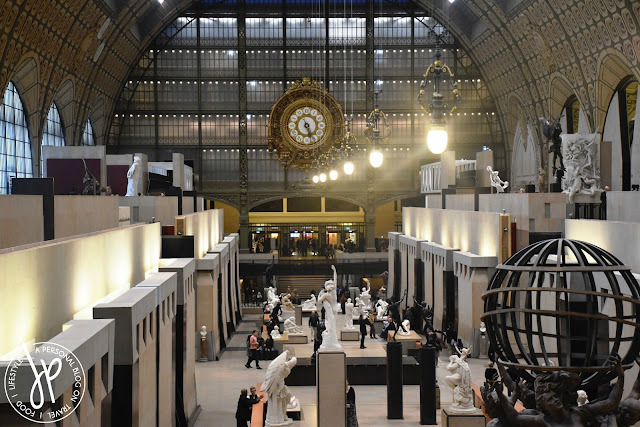 By 3:00 PM, my hands were already frozen cold so I asked my husband if we could go visit Musée d’Orsay. 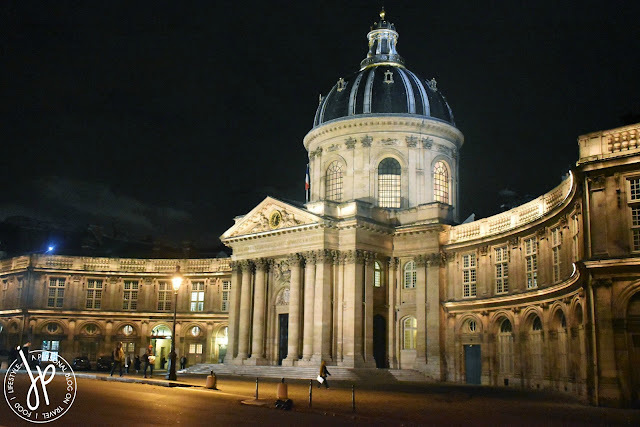 We hopped on the bus once more and alighted in front of the museum. 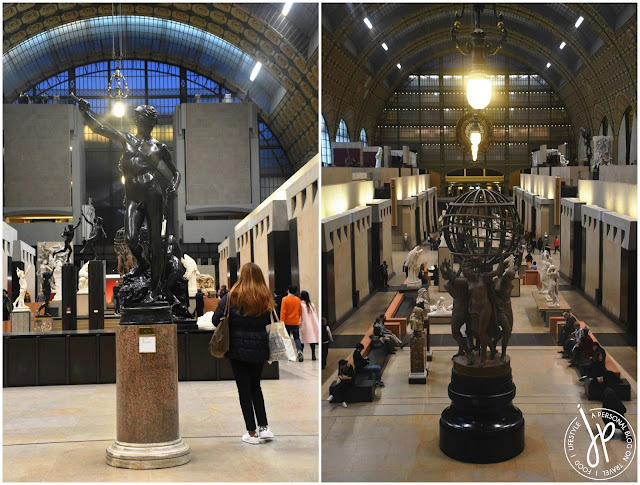 Musée d’Orsay is definitely smaller than The Louvre, more intimate. We thought we couldn’t come in anymore as we arrived a little over an hour before closing. People were still dropping by, although I thought the museum was no longer accepting visitors as there was a build-up at the ticket counter. After about 5 minutes, they announced that visitors can now come in for free! That’s so awesome! 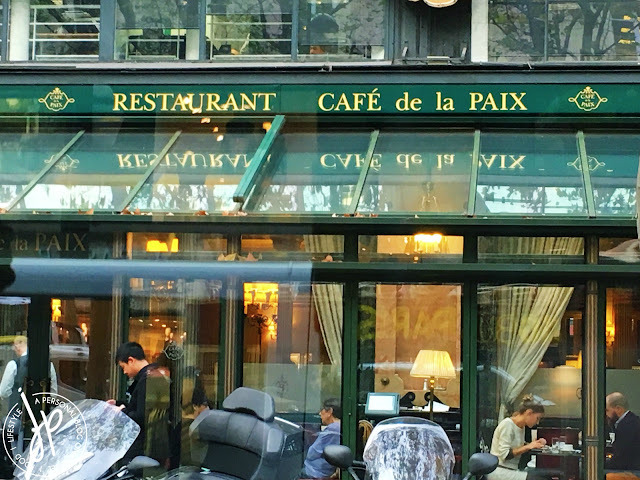 Café de la Paix located at the Right Bank, 9th arrondissement in Paris. 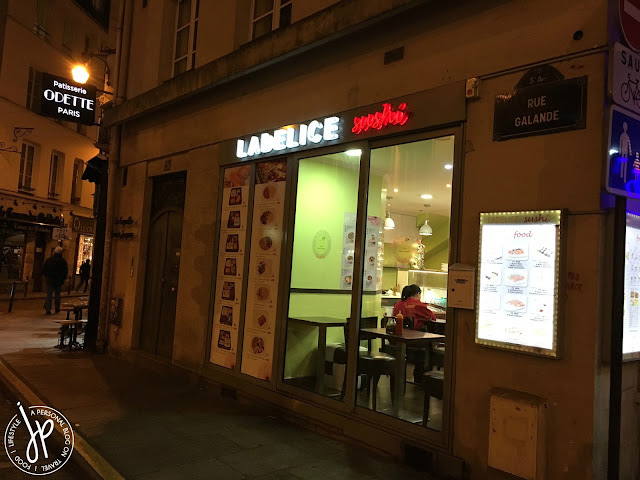 It was known that the Paris' aspiring and famous literary geniuses had their coffee and dinner here before heading to the Opera. 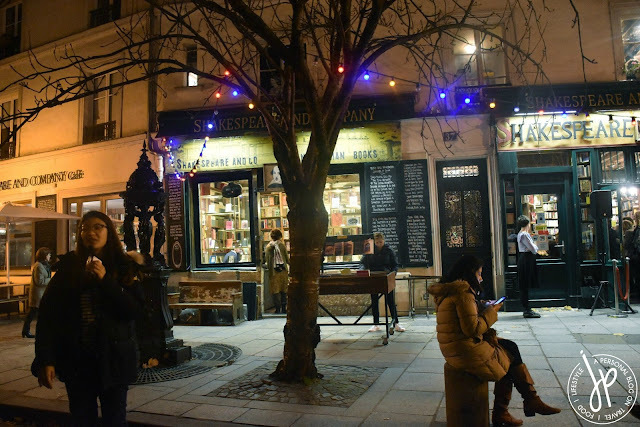 Famous writers who dined here were Oscar Wilde, Emile Zola and Guy de Maupassant (info from tripsavvy.com and Big Bus Paris audio guide). 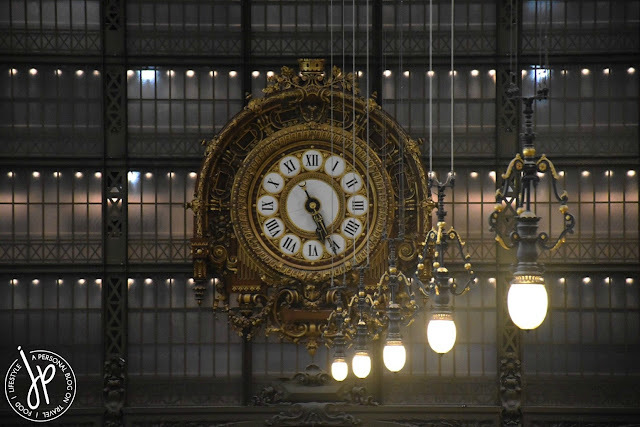 Musée d’Orsay was formerly a train station and the most striking marker of the museum was the clock, created by Victor Laloux. 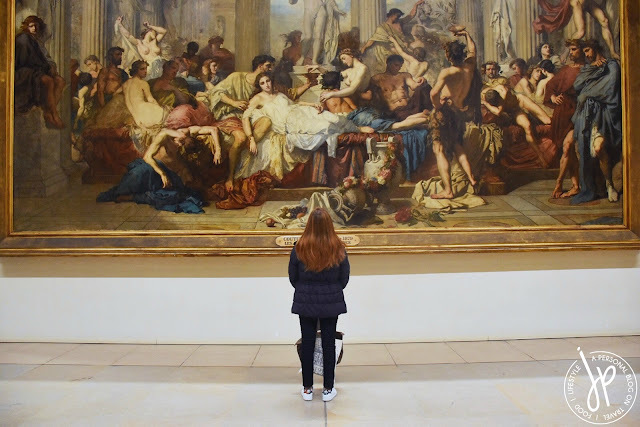 The said museum contains the biggest collection of impressionist and post-impressionist works in the entire world, including masterpieces of Renoir and Monet. I actually wouldn’t mind spending €12 the next time I go here, for I love the cozy and intimate ambiance as we looked at paintings and sculpture on display. 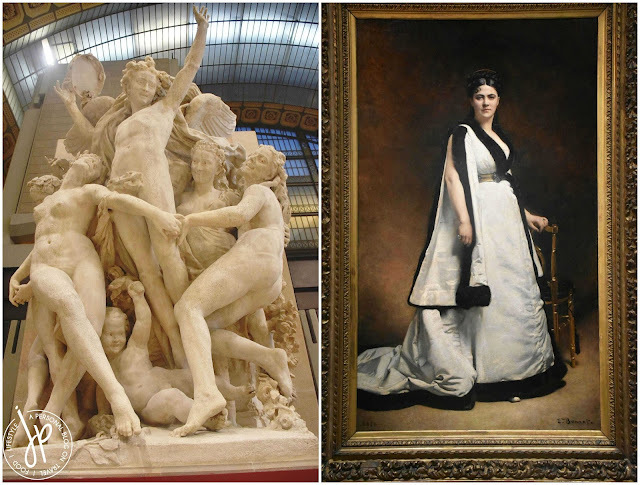 Left: La Danse by French artist Jean-Baptiste Carpeaux, initially installed at the facade of Opera Garnier. 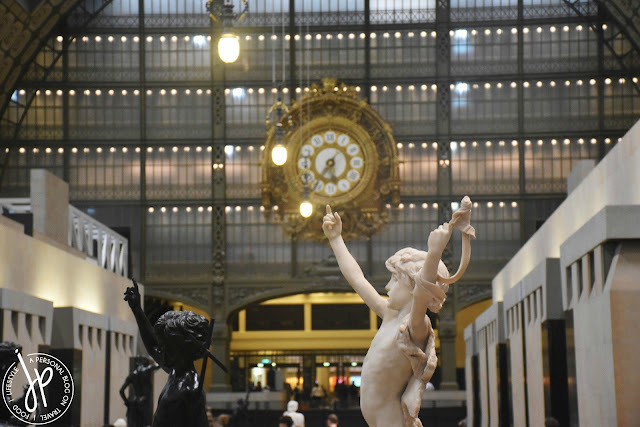 The original statue can be found at Musée d'Orsay. Right: Madame Pasca portrait by French painter Léon Bonnat. She was a French stage actress. The Paris Opera or The Opera Garnier is the creation of architect Charles Garnier. 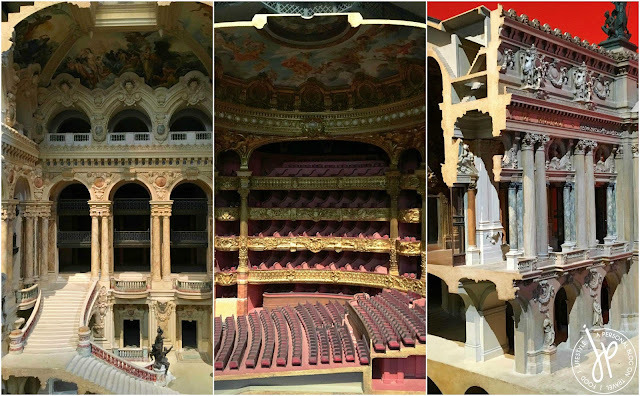 A scaled model of L'Opéra Garnier can be seen at Musée d’Orsay. 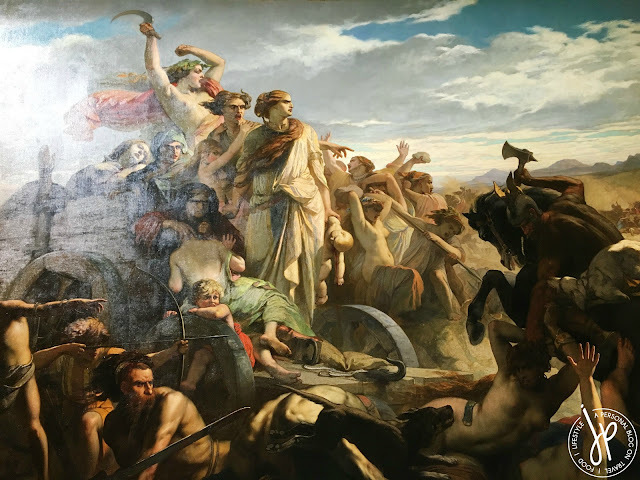 More than 6 meters long painting of Les Femme Gauloises (Gallic Women: Episode of the Roman Invasion) by Auguste Glaize. 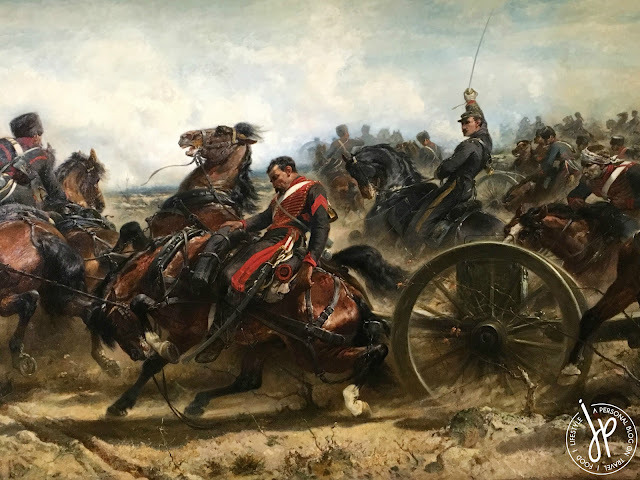 Restored version of Adolf Schreyer's Charge de L'artillerie de la Garde Impériale à Traktir en Crimée (Charge of Artillery of Imperial Guard in Traktir, Crimea, 16 August 1855). 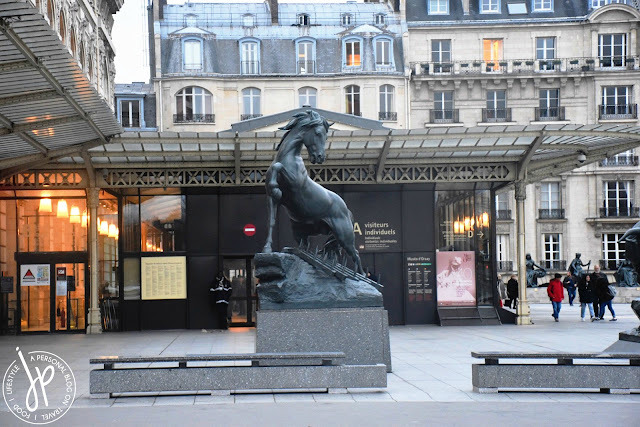 This is one my favorite paintings at Musée d’Orsay, as the play of light and colors, and the "movement" of horses make the scene very much alive. We exited the museum as soon as they announced it was closing time. 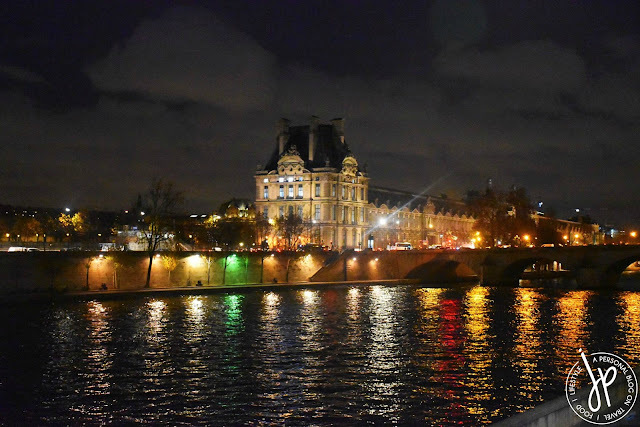 Because it was such a chilly and lovely evening with clear skies, my husband and I walked from Musée d’Orsay going to Ladelice Sushi (yet again). It was a 20-minute walk until we reached the corner of Rue du Petit Pont so by the time we reached the restaurant, we were already starving. I couldn’t remember what we had for dinner, but I’m certain it was rice plus a round of Coke. 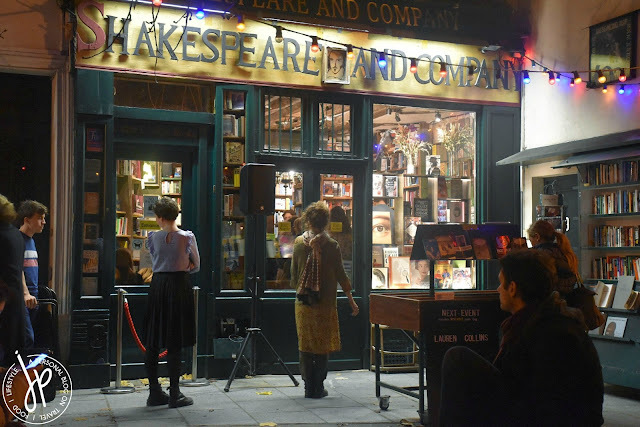 I wanted to drop by again at Shakespeare at Company, for the bookstore was more alive this time of night. A book reading event was being held, so entering the store and purchasing of books weren’t allowed while the event was ongoing. While the event space was limited and only a small group of guests were seated inside, it was good that they put up speakers outside so other visitors can still listen to what was going on during the event. After 15 minutes, it was time for me and my husband to go back to the hotel. 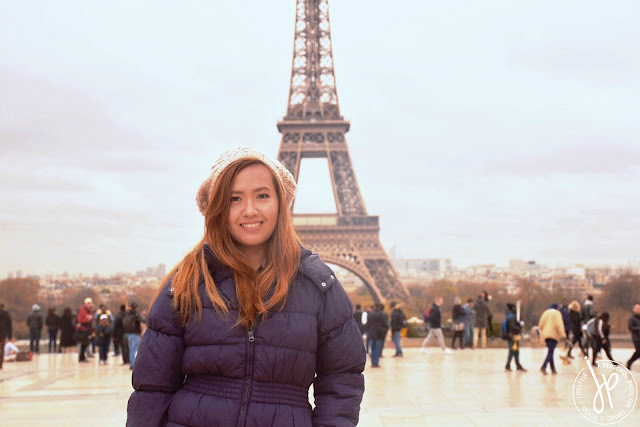 Though we were tired from our activities the entire day, we just couldn’t resist walking around beautiful Paris. 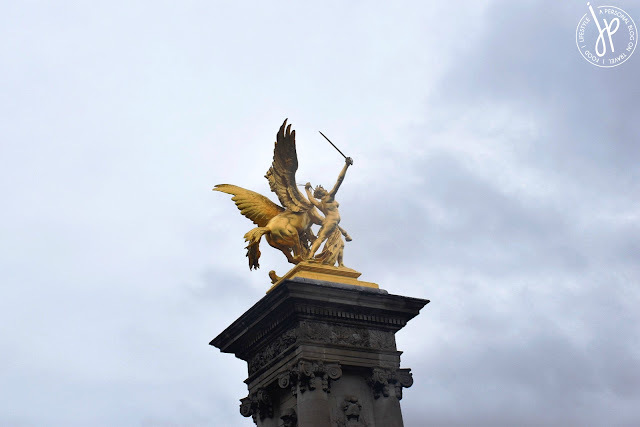 As we were crossing Pont Neuf, we stopped by Statue équestre d'Henri IV and noticed that the love locks were already there (which was previously at Pont des Arts, the bridge that connects 1st Arrondissement and 6th Arrondissement). We didn’t attach any lock, for we wanted to do it the next time we go back in Paris, hopefully with a little one on the way.